The Harmar Single Fold Safety Ramp is built to traverse steps, curbs and other unkind elevation changes. lengthwise to be carried like a suitcase with metal handle. Excellent stability with a slip-resistant surface. 2' Single-Fold Ramp; Anti-slip High Traction Surface 10 lbs. 3' Single-Fold Ramp; Anti-slip High Traction Surface 15 lbs. 4' Single-Fold Ramp; Anti-slip High Traction Surface 20 lbs. 5' Single-Fold Ramp; Anti-slip High Traction Surface 24 lbs. 6' Single-Fold Ramp; Anti-slip High Traction Surface 28 lbs. 7' Single-Fold Ramp; Anti-slip High Traction Surface 34 lbs. 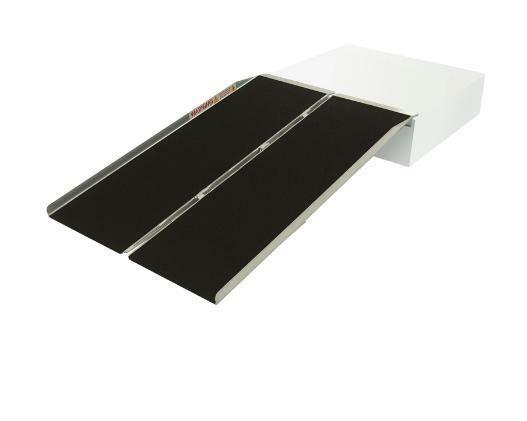 8' Single-Fold Ramp; Anti-slip High Traction Surface 46 lbs.